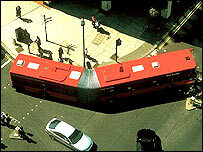 Transport officials have been banned from claiming London's new bendy buses are quicker to board than the double decker vehicles they replaced. The Advertising Standards Authority (ASA) has upheld complaints over claims made about the introduction of the new buses on the 73 route. 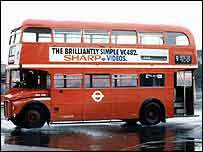 Posters and leaflets produced by Transport for London (TfL) claimed the new bus would improve boarding times. The ASA said faster boarding times were misleading and should not be repeated. But the ASA said a claim the new buses gave more comfort was justifiable. TfL said the frequency of the 73 had been reduced but the new service had significantly increased the capacity of the route during peak hours. They also emphasised there was a distinction between "dwell time", which is defined as the time between the wheels stopping and moving again, and "boarding time", which is defined as the time during which people were passing through the bus doors. A report supplied by TfL, showed that the time taken for passengers to pass through the doors of bendy buses was equal or shorter to the time taken on double deck Routemasters. But the report also revealed bendy buses had a shorter dwell time than Routemasters if 10 or more passengers boarded, but a longer dwell time than Routemasters when fewer than 10 passengers boarded. Concluding the claim was "misleading", the ASA said in its ruling: "Although the authority acknowledged the advertisers had justified the claim on the technical definition of boarding time, the authority considered that, from a consumer point of view, 'faster boarding' would mean the bendy buses spent less time waiting at bus stops to allow passengers to get on and off." The authority also upheld a second complaint that as boarding times' claim was misleading, TfL could not be justified in a subsequent claim that buses were "getting better from every angle". But the ASA did not uphold a third complaint against a claim which stated: "Bendy Buses are designed to offer you greater comfort, with climate control and enhanced security with CCTV."